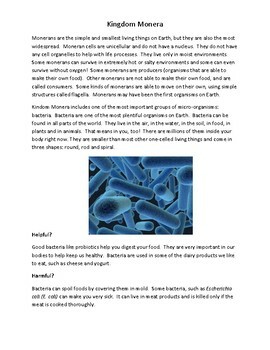 These handouts consist of three full information pages, about Kingdom Monera, Kingdom Protista, and Kingdom Fungi. Each page begins with a description of the kingdom, including examples. 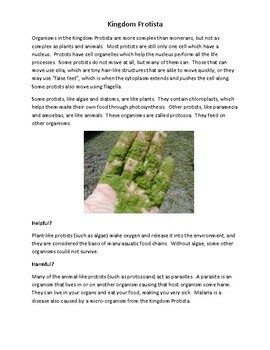 The pages also discuss if the micro-organism is helpful or harmful. It acts as a great resource for introducing these concepts to students! Additionally, this product includes a page of comprehension questions, where students have to match the description to the correct kingdom (answers can all found in the information sheets).